England upset the formbook in dramatic style to dismiss Australia for 190 on the first day of the first Ashes Test at Lord’s here today. Paceman Steve Harmison took five wickets. Sri Lanka go into the second cricket Test against the West Indies here tomorrow boosted by the quick recovery of star bowlers Chaminda Vaas and Muttiah Muralitharan from a flu virus. The marriage of former Pakistani cricket captain Javed Miandad’s son would normally be a joyous occasion, with the cream of Pakistani society jostling for invitations. Pakistani fast bowler Shoaib Akhtar grabbed six wickets while England reject Graham Thorpe handed the England selectors a timely reminder of his Ashes credentials on yesterday. A thrilling draw for P. Harikrishna and an agonising defeat for his nearest rival in the 11th and final round gave the world junior champion the title in the second Sanjin Hotel Cup Grandmasters chess tournament here. For the second day in a row, Indian gold aspirants, Woman Grandmaster D. Harika and Parimarjan Negi, scored easy victories in the second round of the World Youth Chess Championships here. After completing 101 trouble-free laps in last week’s testing, Narain Karthikeyan says he will do his best to finish the race despite the challenge posed by the unfamiliar Hockenheim ring, venue for this Sunday’s German Grand Prix. Asian Football Confederation (AFC) secretary-general Dato Peter Velappan said here today that India had the potential to become a “super power” in the game, provided the talent in the country was properly harnessed with a professional approach and attitude. The toss for captaincy during the eight-nation tournament in the Netherlands next month will be between three-time Olympian Dilip Tirkey and midfielder Viren Rasquinha. India sweeps cycle polo series against Pakistan. The management of Maharaja Aggarsain Girls’ Senior Secondary School here has demanded the immediate reopening of the judo academy at the school. The Congress government had ordered closure of the judo nursery last month without assigning any reason. Sania Mirza maintained her winning streak as she notched up a strong doubles victory in the WTA Tour tennis event in Cincinnati, Ohio, yesterday. Sania and Ukrainian Yuliana Fedak ousted qualifiers Sybille Bammer of Austria and Jewel Peterson of the USA 5-7, 6-2, 6-0 in the first round. Glenn McGrath took five wickets, including his 500th Test victim as England, chasing Australia's 190 all out, closed the opening day of the first Ashes Test on 92 for seven. 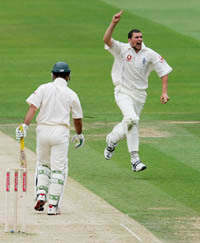 After Australin captain Ricky Ponting won the toss in overcast conditions, Harmison, England’s quickest bowler, needed just two balls to hit left-hander Justin Langer above the right elbow as the batsman turned away and took his eye off a lifting delivery. Matthew Hayden, on 11, then suffered at Harmison’s hands when he missed an intended hook and was hit flush on the helmet. It was tough, attritional cricket with England bidding to end a run of eight successive Ashes series defeats. But it was swing bowler Matthew Hoggard who grabbed the first wicket when he bowled Hayden for 12 with a ball that came back in fractionally, beat the left-hander’s intended drive and hit off-stump. And England, second in the world Test rankings behind their oldest foes, then almost had the prized wicket of Ponting for nought second ball when he nicked a Hoggard outswinger, only for debutant Kevin Pietersen to drop the fourth slip chance. Ponting then became the third Australian batsman to be hit by Harmison when he missed a hook off the Durham quick, the ball deflecting off the peak, going above the grille and drawing blood under the right eye. He faced only 10 more balls before Harmison struck in conventional fashion, Ponting, on nine, opening the face and edging to Andrew Strauss at third slip. That was the start of a collapse that saw Australia lose three wickets for 11 runs in 15 balls as they slumped to 66 for four. Allrounder Andrew Flintoff, with his fourth ball in Ashes cricket, had Langer top-edging a hook to Harmison at short backward square leg for a 44-ball 40, including five fours. Jones, who bowled seven overs on his Ashes debut in Brisbane in November 2002 before suffering a major knee injury while fielding, that kept him out of international cricket for 16 months, then got in on the act. With his first ball, the Glamorgan quick had Damien Martyn (two), wafting outside off-stump and edging to Brisbane-educated keeper Geraint Jones, one of five England Ashes debutants. McGrath scythed through the English top order, taking five for 21 from 13 overs on a pitch offering some uneven bounce. McGrath took all his wickets for just two runs in a 31-ball burst to reduce England to 21 for five. The 35-year-old had Marcus Trescothick (four) caught behind off the first ball after tea for his 500th victim and followed that up four balls later as Andrew Strauss (two) went in similar fashion. Soon it was 18 for three as McGrath flattened Michael Vaughan's stumps. The England captain made three. Ian Bell edged it into his leg stump for six, while Andrew Flintoff was also bowled for a duck as the ball skittled through low. Kevin Pietersen (29 not out) and Geraint Jones (30) battled back with a 58-run stand before Ashely Giles trod on his stumps facing the last ball of the day. Fall of wickets: 1-35, 2-55, 3-66, 4-66, 5-87, 6-126, 7-175, 8-178, 9-178, 10-190. Bowling: Harmison 11.2-0-43-5, Hoggard 8-0-40-1, Flintoff 11-2-50-2, S. Jones 10-0-48-2. Fall of wickets: 1-10, 2-11, 3-18, 4-19, 5-21, 6-79, 7-92. The veteran duo, who struck a rich haul in the six-wicket romp for the hosts in the first Test in Colombo last week, were the latest victims of the virus that gripped the Sri Lankan team. “Almost half the side had been down with the virus in the past few weeks,” captain Marvan Atapattu revealed after the team’s nets at the Asgiriya stadium here. “It started with the manager (Michael Tissera) and I too had it before the first Test before some of the others got it”. “Vaas and Muralitharan were the worst affected. They have recovered well and will be fit to take the field on Friday,” the captain said. 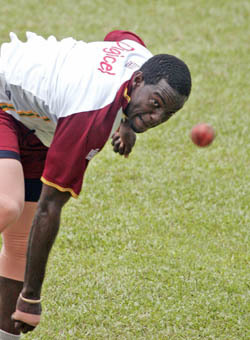 Vaas topscored with 49 and claimed seven wickets to win the man of the match award in the first Test at the Sinhalese Sports Club in Colombo. Muralitharan marked his return to international cricket after 11 months due to a shoulder injury by bagging six for 36 in the West Indian second innings. It was the prolific off-spinner’s 45th haul of five or more wickets in an innings and took his career tally to 539 wickets, second only to Australian Shane Warne’s world record mark of 583. Both bowlers will once again play a key role as Sri Lanka attempt to sweep the short two-Test series against the second-string West Indians, provided the weather holds. Although today dawned bright, allowing the two teams to finally gain some practice, the forecast is for light seasonal rain on all five days of the Test. Left-arm seamer Nuwan Zoysa and leg-spinner Upul Chandana are expected to come into the reckoning for Sri Lanka in place of young allrounder Gayan Wijekoon and left-arm spinner Rangana Herath. The West Indies, meanwhile, will once again rely on captain Shivnarine Chanderpaul, the only experienced player in the weakened squad, to prevent a 2-0 scoreline for the hosts. The left-hander, whose 87 Tests dwarf the rest of the squad’s 55 matches put together, topscored in both innings of the Colombo Test with 69 and an unbeaten 48. The marriage of former Pakistani cricket captain Javed Miandad’s son would normally be a joyous occasion, with the cream of Pakistani society jostling for invitations. Saturday’s wedding in Dubai between Junaid Miandad and Mahrukh Ibrahim is, however, shrouded in secrecy and some of Miandad’s cricketing colleagues are unlikely to attend as the bride is the daughter of India’s most wanted man. Dawood Ibrahim is accused by the Indian Government of a wave of bomb attacks in Mumbai in 1993 that killed 260 people and the union between his family and Miandad’s has raised eyebrows in both India and Pakistan. Ibrahim is also accused by the USA of financing Islamic militants. The US Treasury put him on a global terrorist list, linking him to the Al-Qaida, in 2003. Miandad has been reluctant to discuss the marriage and has declined to give details of the venue, or the list of guests for the ceremony in Dubai. He did say before leaving for Dubai with his family on Monday, though, that a big reception was planned next month in Karachi. ‘’We will invite our friends, relatives and well-wishers for a reception in Karachi on August 4 to celebrate the marriage.’’ Miandad declined to say whether the bride’s father, who had not been seen in public for years, would attend either ceremony. India says he is in hiding in Karachi, but Pakistan denies this. Miandad is considered one of the country’s all-time cricketing greats. He insists that the marriage is a sacred and personal matter and no one has any right to comment on it or pass judgement. ‘’We have accepted the girl as our daughter-in-law and we are happy with the situation. The children should be left alone,’’ he said. Ibrahim was often seen in the company of Pakistani and Indian cricketers, film stars and politicians until the Mumbai bombings. Miandad is thought to have first met Ibrahim in Sharjah in the mid-1980s, when the latter attended a series of high-profile cricket matches between India and Pakistan which attracted the sub-continent’s fashionable elite. A former team-mate said Miandad became a favourite of Ibrahim during that period. ‘’Ibrahim is a generous person and he used to bestow gifts on players and cricket officials in Sharjah until he went into exile,’’ said the cricketer, who did not want to be identified. Junaid met Mahrukh in London, where he is studying, but it is not generally known if the marriage is a love match or a traditional arranged union between the families. Harikrishna, who had a half point lead over Russian champion Alexander Motylev going into the last round, settled for peace with Sergey Karjakin of Ukraine. With Chinese Grandmaster Bu Xiangzhi handing Motylev a stunning defeat, the draw was enough for the Indian to clinch the crown in the category-15 event. Harikrishna scored 8.5 points in all with seven victories, four draws and a lone loss against Motylev, who finished second with 7.5 points. The third place was shared by Chinese duo of Wang Yue and Bu Xiangzhi, who both scored 6.5 points apiece. Ni Hua of China finished fifth on 6 points while Karjakin was next along with Tgran Petrosian of Armenia on 5.5 points. The last round was quite exciting for Harikrishna, who could not help remember his world junior triumph late last year. “It was similar to my world junior title position before the start of the last round,” Harikrishna said soon after the game, adding, “There too, I was in a half point lead, but my nearest contender was having a better tiebreak score, so I could not go for a draw quickly”. The Indian, playing white, opened with the queen pawn and Karjakin showed his peaceful intentions by going for the queen’s gambit accepted. Keeping pieces on the board was Harikrishna’s idea of continuing and he did precisely that in one of the main variations in the early stages. However, later, Harikrishna went for many exchanges and while it looked like Xinagzhi was home against Motylev, Karjakin was pleased to accept the draw proposal of the champion. Motylev lost an engrossing battle against Xiangzhi, who played the black side of a Sicilian Nazdorf. Going for the English attack, the Russian was caught off guard by a direct attack, against his own king and no matter what he tried, Xiabzhis energy, compiled with his moves, proved stronger. The game lasted 34 moves. In other decisive games of the last round, Wang Hao of China lost to compatriot Zhang Pengiang while English Grandmaster Luke McShane’s poor run did not end against Wang Yue also. While Harika scored over Iryna Khudaya in the under-16 girls section, Negi was also quite outstanding in his victory over Stephen Kaphle in the under-12 boys championship. The event was being held on a Swiss league basis in 10 different categories and over 1000 players in contention for 30 medals in various age groups. In the under-10 boys section, Shiven Khosla and Sahaj Grover maintained their clean slate. Khosla played well to beat Ian Guido Ocampos, who played black, while Grover also scored with pieces over Fu Xiaoyong. Among other Indians in the section, K. Sudarshan opened his account, defeating Romain Banms-Robles, and Rishi Thariani drew with Irwin Rakotoniaina to inch to 1.5 points. In the girls section, K. Sai Nirupama was held to a draw by Anna Iwanow. Giving company to Negi on 2 points in the under-12 boys were S.P. Sethuraman, N. Srinath and V.A.V. Rajesh, who all also won their second round games to move to 2 points. Sethuraman was quite impressive in winning with black pieces against Yi-Ren Daniel Chan, Srinath accounted for Karoly Szalay and Rajesh got the better of Yusup Atabayev. Putting behind the disappointments of the last two races, the Jordan driver says he is motivated to do well in the back-to-back races in Germany and Hungary. “The two-day test went very well at Paul Ricard last week. We focused especially on working on different types of Bridgestone tyres and finding a good set-up for the forthcoming races,” Karthikeyan said. “In Hockenheim, I will do my best to finish the race as I encountered some technical problems at the last two Grands Prix. I am really motivated to do well there. Once again this season, Hockenheim is a circuit I have never driven on, as will be the case in Budapest next week,” the 28-year-old said. The Jordan drivers finalised their preparations for German and Hungarian Grands Prix, the third consecutive double-header of the season, with a last two-day test session on July 14 and 15, before F1’s summer testing ban. He said the days of freebies were over and the All-India Football Federation (AIFF) should make efforts to get the system working professionally. He said the people associated with running of football in the country should be paid employees and not voluntary workers. He warned that it was a “now or never” chance for India to overhaul its soccer set-up and the AIFF should seize this golden chance to infuse professionalism in every aspect of the organisation of football in the country. Mr Velappan, who was speaking after the two-day deliberations of the Vision India Pilot Project, involving Delhi and Manipur, which is part of AFC’s larger plan of tapping the huge soccer potential in Asia, noted that it was India’s “last chance” to come good. “If the AIFF does not grab the chance, God save Indian football”, he mused. He said Indian football has progressed from amateur to semi-professional status, but a lot more needs to be achieved to catchup with rest of Asia and the developed world. But he was happy to note that India had a “rich football culture” and the AFC was hoping to cash in on this encouraging aspect. “There is enough potential which needs to be polished and marketed well. 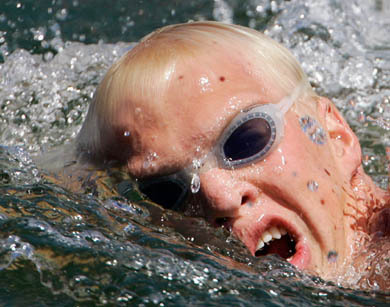 In the coming years, we hope to exploit this enormous talent pool”, he observed. Mr Velappan said the AFC’s pilot project in Delhi and Manipur would be used as models for implementation in other states with some modifications to suit the local conditions and facilities. “Delhi and Manipur have distinct soccer cultures and conditions which call upon different approaches to put the game on a professional pedestal”, he added. The AFC secretary-general said the task force formed to implement the pilot projects in Delhi and Manipur should be fully committed and focussed on bringing changes through tailor-made programmes and also by involving the concerned local agencies. Mr Velappan was confident that once the game was run in a professional manner, “football will take off in the country”. AIFF president P.R. Dasmunsi reiterated India’s resolve to overhaul the soccer set up to be in tune with the exacting standards formulated by the AFC. He said the pilot projects in Delhi and Manipur will be launched in September. AFC will be funding the appointment of the staff while the AIFF and the state associations will have to generate funds to modernise the game’s setup. The whole process involves a few crores, though AIFF secretary Alberto Colaco refused to divulge the exact figures. “We will do that at the appropriate time”, he said. Mr Velappan said the soccer season should stretch at the state level to six to eight months with each club getting to play around 40 matches. And the AIFF calendar will also have to be reorganised to avoid clashing with the FIFA and AFC calendar. As part of the pilot project, Delhi will organise the City Elite League for a dozen clubs while Manipur will hold the State League. This is intended to bring drastic changes in the structure and function of the clubs. The two-day conference was attended by representatives of all the major bodies in Delhi, Sports Authority of India secretary Dr B.K. Sinha, DSA president Nawabuddin Zaheer, secretary N.K. 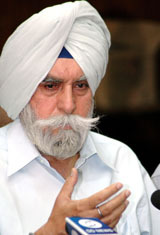 Bhatia, B.K. Bowmik of ONGC and women’s football association representatives Deepa Munsi and Mrs Mukesh Saggar and key officials of the Manipur Government and soccer body. Indian Hockey Federation sources today disclosed that a lobby within it was backing the candidature of 25-year-old Mumbai-based Rasquinha as he was in the running for the Arjuna Award this year. His elevation would strengthen his case for the award, felt his supporters. A team insider revealed that the claims of Tirkey, one of the most accomplished deep defenders in contemporary hockey, could not be overlooked easily. If Rasquinha was made captain, discontent might creep in as other players, including left-half Ignace Tirkey, left-winger Prabhjot Singh and striker Deepak Thakur, were in the reckoning for the award this year. Another reason that might go against Rasquinha was that Gagan Ajit Singh, Prabhjot and Deepak were senior to Rasquinha. The rock-solid Tirkey, who led the squad in the 2002 Busan Asiad, the 2003 Afro-Asian Games and the 2004 Athens Olympics, was a veteran of 320 international matches. Compared to Tirkey, Rasquinha was a greenhorn. Rasquinha had turned out for the country in 120 matches. “Despite showing the best results in various judo competitions, the state government acted in haste,” said the Principal, Dr Sheema Biswas. “It seems to be a vindictive move by the Hooda government as the top management is considered close to the Chautala family,” said a member of the management. The school had bagged the first position in judo among 7,500 CBSE-affiliated schools for the past three years. Two of its students, Mamta Devi and Neena Saini, had been selected to represent India.